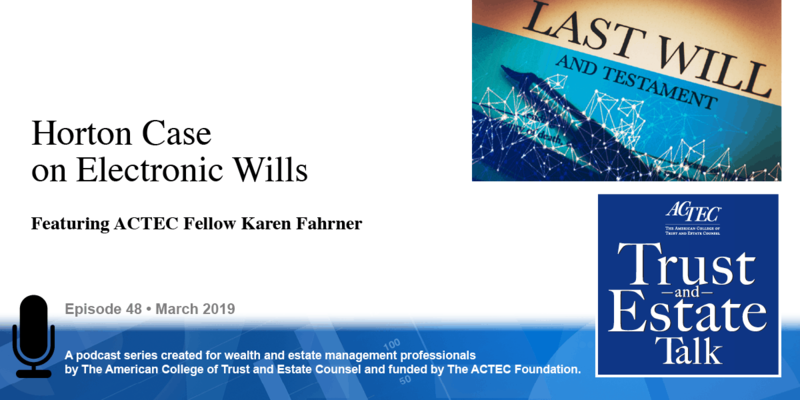 “Section 199A and the 20% Deduction for Qualified Business Income.” That’s the subject of today’s ACTEC Trust and Estate Talk. This is Susan Snyder, ACTEC Fellow from Chicago. The Department of Treasury and the Internal Revenue Service have issued proposed regulations under Section 199A dealing with the 20% deduction for qualified business income. 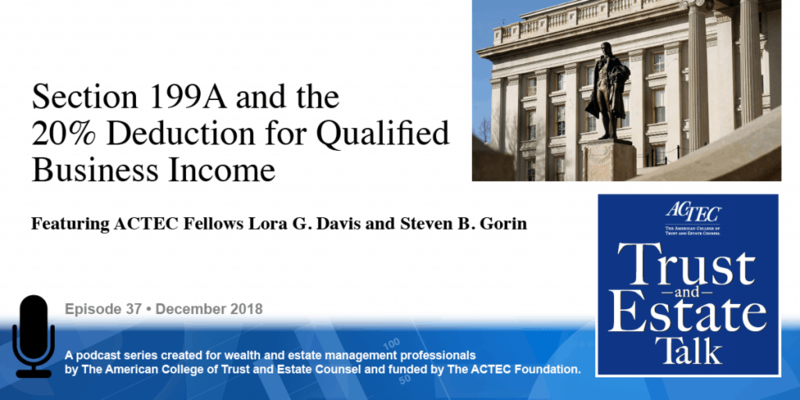 To discuss ACTEC’s recently filed comments to those proposed regulations you will be hearing today from ACTEC Fellows Lora Davis of Dallas, Texas and Steve Gorin of Saint Louis, Missouri. Hi, this is Steve Gorin. 2017 tax reform has presented some incentives to have some multiple entities and splitting up income. So one of those is that state income taxes are limited to $10,000. 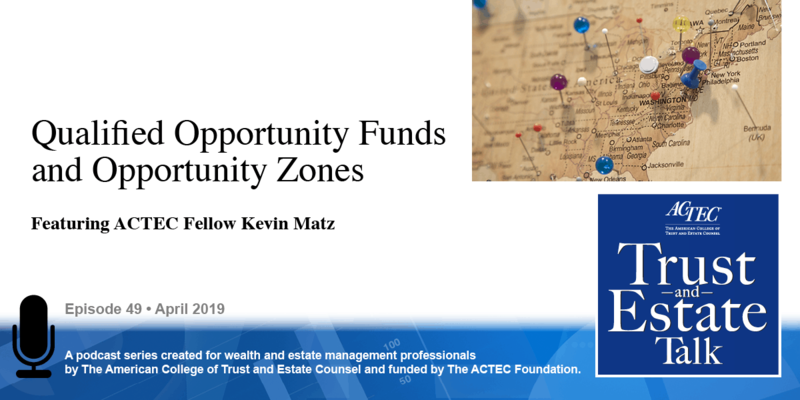 That $10,000 limit applies for itemized deductions for not only state income taxes but also personal property taxes and real estate taxes for personal use property. 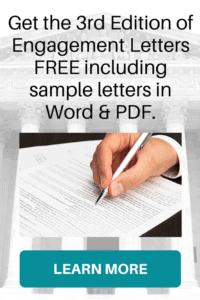 So one thing that people may want to do is to maybe try to spread their business income among family members so that each person can take separate advantage of this amount up to $10,000 that can be deducted. Also, there’s a brand new law under tax reform for a pass through deduction for qualified business income. So if somebody has income from a sole proprietorship or an S corporation or an entity that’s taxed as a partnership, which would include an LLC then they may be able to deduct up to 20% of the qualified business income that’s generated by that business. Now this 20% deduction has various limitations that the law applies to it. And, those limitations do not apply if taxable income is below certain thresholds. So the thresholds are $315,000 of taxable income for married filing jointly and $157,500 for single individuals, married filing separately, or trusts. So to take advantage of those thresholds again dividing the family income among family members will help you use each person’s, or each individual’s, or each trust’s taxable income on a separate basis. Now as estate planners we really don’t like having outright gifts to family members because those are subject to creditors and other predators like divorce or whatever. And so we like to use trusts. So people have talked about splitting this income and using trusts for them and when the IRS heard about it, they really didn’t like them in fact they decided, I believe, that trusts are just plain old evil. So here to make some comments about what the government has said about trusts is Lora Davis. Hi, this is Lora Davis. So Steve’s right, they really went after trusts in these proposed regulations that were recently issued in connection with 199A. And the first thing they did is they denied trusts the ability to take the distribution deduction and calculating that threshold amount which is a really unfair result and which Treasury officials have said is because they are worried about people trying to take advantage of these rules through trusts, as Steve had pointed out. They also issued two separate regulations, one of the regulations is under 199A and what that rule says is that trusts formed or funded with a significant purpose of receiving a deduction under 199A will not be respected, but only for purposes of 199A. Not quite sure what not being respected means and so stay tuned for more from the IRS on that. Although informally the IRS has indicated that that means there’s no deduction at all if available under 199A. A more proportionate rule would be to say, “the trusts are trying are there to avoid the taxable income threshold benefits so we’re just going to take away the taxable income threshold benefits and that’s what ACTEC said that we suggest, but as Lora mentioned we don’t really know what it means that they’re not going to be respected, we will have to see what kind of clarification they have. And I’ll also point out that this rule can apply to just one trust being created, that’s not the multiple trust rule that I’ll talk about now, there were additional rules that were proposed under Section 643 to give some regulatory authority for the IRS to attack multiple trusts as Steve talked about spreading out of different beneficiaries. 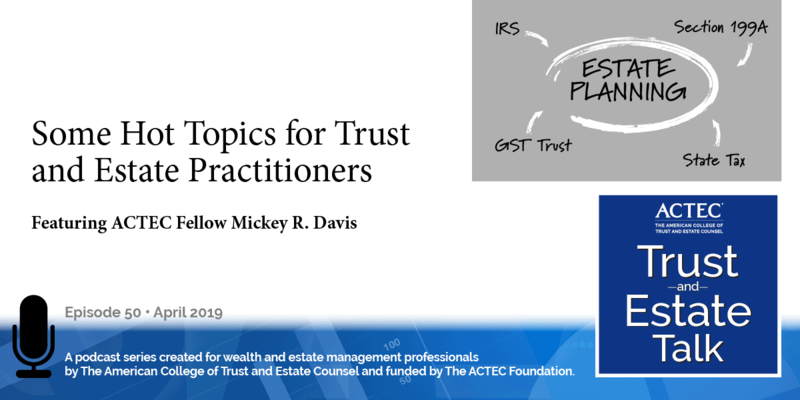 So the multiple trust rule requires you to have 2 or more trusts and those trusts have to have substantially the same grantor or grantors, substantially the same primary beneficiary or beneficiaries and have a principal purpose of avoidance of federal income tax. So I want to point out that that’s what the statute says but the regulations expand on that and say that it applies to the initial creation of a trust but contributions of additional property or to an existing trust. So, Steve, what do you think about those multiple trust rules? How is that going to apply in real life? Because as planners we create multiple trusts for family members all the time. And we really don’t know, the rules says that multiple trusts created will be treated all as one, but if you had 5 different trusts that were created for the children a number of years ago when there was no real tax benefit doing so and then you might add a sixth trust that sprinkles benefits among the children then what does that mean? Does that mean that we’re going to have all six trusts counted as one or are we going to have the attributes of the sixth trust added to the attributes of the five? We really don’t know. And the proposed regulations are kind of vague about it but they’re really vague because the legislative history is vague and really I think that Congress made just a big mess of this and Treasury has done a good preliminary job but there’s still a ton more to be clarified. And ACTEC’s comments on the proposed regulations go into some details on what we think some solutions may be. Yes, and for more information on this you should look to the ACTEC/ALI-CLE program, it was done on October 17th and we’ll put a link on the website to see that if you’d like. Thank you Laura and Steve for your insights on qualified business income.